Every year in december thousands high lamas, monks, nuns and lay practitioners gather under the guidance of the the 17th Gyalwa Karmapa in Bodhgaya, to pray for the world peace and happiness of all beings. Bodhgaya is a place, where historical Buddha Shakyamuni attained enlightenment. It is know as the most sacred place for all buddhists. Kagyu Monlam Chenmo takes around one week and that time everyone wishes and aspires together. Monlam in tibetan means aspiration prayer. It is said that gathering and aspiring together had a great benefit. It is also said that Bodhgaya, place where Buddha understood the nature of phenomena has great power and blessing. 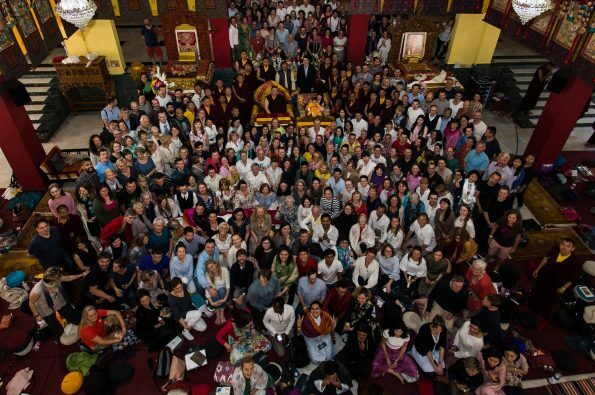 Therefore all Kagyu practitioners gather under the Bodhi Tree. Every day set of prayers and practices is chanted in tibetan, especially well know as King of Aspiration Prayers: Samanthabadra’s Wishing Prayer. Main aim of the prayer is the idea of attaining enlightenment in order to be helpful and beneficial for all sentient beings. The Mahabodhi Stupa in Bodh Gaya may well be the most important Buddhist pilgrimage site in the world. The location in Bihar, India is said to be the exact spot where Siddhartha Gautama, over 2,500 years ago, attained the supreme enlightenment of a Buddha. The Stupa itself was erected around 250 BC by the great emperor Ashoka, a once notoriously violent ruler who converted to Buddhism during his reign after seeing the affects of his violent ways and, thus, devoting the rest of his life to the preservation and propagation of the Buddhist Dharma. Since the Chinese occupation of Tibet, many Tibetans have migrated west to the birthplace of their faith. While living in Tibet, it was common to have an annual prayer gathering called “Monlam Chenmo”. This was a tradition started by the great Buddhist patriarch Je Tsong Khapa in the 15th century and was carried out up to the Chinese cultural revolution, when it was banned by the newly established communist government. Once in exile, many Tibetans sought refuge in India, finding themselves in the unique position, for a Tibetan, of now being able to easily visit the most holy places associated with the life of Lord Buddha. After some time, the tradition of the Monlam Chenmo was continued in exile and, of course, the Mahabodhi Stupa in Bodh Gaya became one of the most popular locations to revive such an event. These days, Monlam Chenmos have become common place in Bodh Gaya.